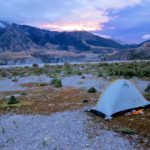 An ‘almost-loop’ trip through Arthurs Pass mountains and braided river valleys. 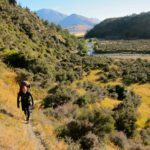 There are a few options for paddling the Poulter, including continuing on down the Waimakariri Gorge. Thanks to Michael Batchelor for the information and photos to make up this trip page. Haydn Deane posted a great video of the Poulter-Waimak Gorge option on vimeo . The road from the highway to Andrews Shelter is fine for most vehicles. Check out the Check out the Casey-Binser Saddle route page on the DOC website for detailed track notes for this 7-8hr walk. Unfortunately, Casey Hut burnt down in October 2015, and there are no current plans to replace it. 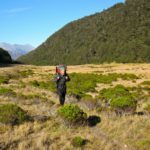 Trust-Poulter Hut is another 1.5 hrs up valley, though the river is likely to be much more boney/shallow up there and it may not be worth the walk. Typical braided river paddling; plenty of class I floating with a few class II wave trains and minor rapids. Like most braided rivers, it tends to get a bit shallow and bony in times of low flow, so perhaps its not the best choice at the end of a long dry spell of weather. There are a few options for getting back to Andrews shelter. You could either walk the road, or shuttle via car or mountain bike. Binser Saddle takes about 3.5 hrs from the Poulter to Andrews shelter. This option means less paddling and more walking but has nice views on the western side on a fine day. With a car shuttle, you could easily combine the Poulter with an extra day or two through the Waimakarirri Gorge (II/II+) which is detailed on a separate page. Visual. There’s no gauge on the Poulter. Like most braided rivers, it tends to get a bit shallow and bony in times of low flow, so perhaps its not the best choice at the end of a long dry spell of weather. 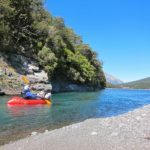 The Canterbury Kayaking website (paddle training provider) has a good list of flow sites for the area, and reccomendations for flows for the nearby Waimakarirri Gorge trip. 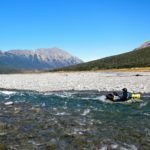 It’s a good idea to consider the wind forecast for the Canterbury High Country ; Canterbury is fequently home to the ‘nor-wester’ which can make packrafting a challenge or threaten safety. I’m not sure of the flow when I did it but there was a boulder garden to navigate through in the Casey-Binser Saddle route area of the river (just upstream and downstream). This was the most demanding area.